1. Chicago is a better city than New York. Culturally, I will give you that NYC is the most important city in America. But Chicago is the best city in America. The architecture is beautiful. Millennium Park is a tour-de-force of art, culture, and monuments to the human condition. The food is amazing, the music is incredible, their sports scene is intoxicating, and the people are kind. 2. Jim Chaney owes Mel Tucker a very nice case of wine. Georgia won this game, and everyone is rightfully excited - but in the waning moments of the third quarter I was preparing myself for another heartbreak at the hands of Jim Chaney and his bewildering play choices. Issac Nauta - UGA's biggest and most reliable target, was limited to one catch and two targets all night. We ran 28 running plays total. This put a lot of pressure on Jake Fromm, who nearly fumbled the game away in the first half. Now, to Chaney's credit - Hardman's dropped TD pass in the third would have completely changed the game, but the pass was dropped. We escaped this week - but similar offensive performances at Knoxville, Jacksonville and Auburn will not be enough to get the Dawgs back to the SEC Championship. 3. Notre Dame does not belong in any football conference. This was my first trip to South Bend, and I was amazed by how the town is in the absolute middle of nowhere. You drive for two hours through a bunch of grass plains and then you come up on this big Catholic school. Anyway - The school is unlike any I have ever visited before. 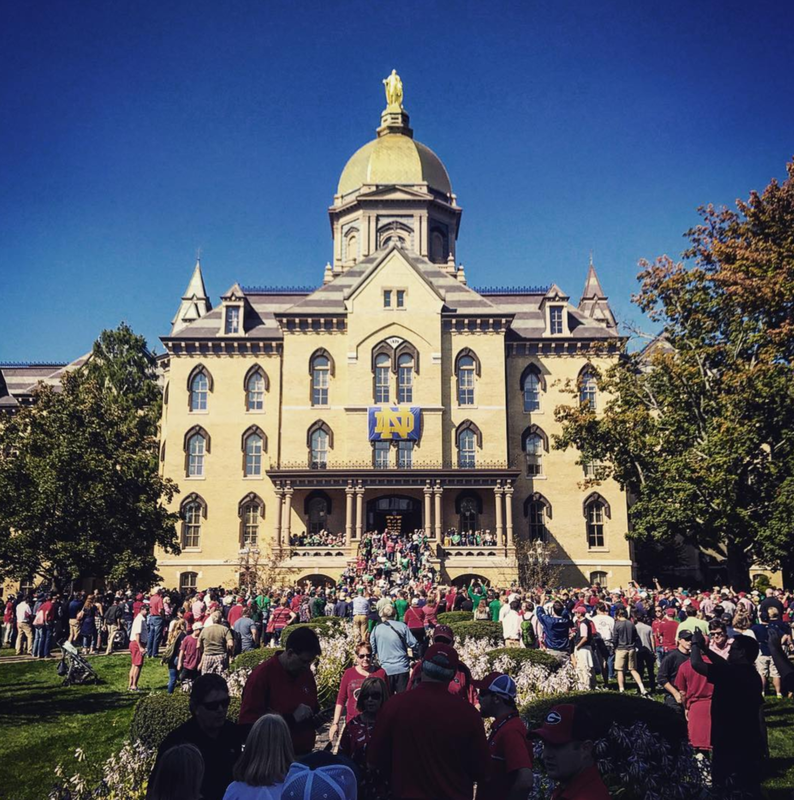 Everyone on campus was incredibly kind, and seemed just as concerned with going to pre and post-game mass as they were with the football game. The students come from all across the country, and then spread out again after graduation. The geography here is culture-centric, not location-specific. These guys are their own thing - and belong as an independent. 4. Chicago Cubs fans were more hostile to UGA people than Notre Dame fans. The only place I caught hell for being a Bulldawg was at Wrigley Field. Suffice to say that the Cubs fans were not amused by their beloved Wrigley Field being transformed into a scene that looked a lot like Clayton Street while the Cubbies were playing a September game with very real pennant implications. Hey - no one ever said living in occupied territory would be fun - you damn yankees! 5. I have been present or on the field for some amazing College Football moments. The start of the 4th quarter in South Bend trumped them all. Back to the Georgia game - The UGA crowd holding up their lights at the end of the Third Quarter gave me chills. I've done some cool things in person in my day - I've run through the T at Tennessee, I've seen UGA come within 5 yards of a national championship with my friends being the ones with the football in their hands, I saw Peyton Manning end a historic losing streak to Alabama, the 2007 Blackout, etc. Seeing tens of thousands of lights flashing on as the Irish played their little song to start the 4th - then hearing the Redcoats blast all across Notre Dame Stadium - was the coolest college football thing I have ever seen. 6. The College Football Playoff means there is no disadvantage for UGA to play one of these games per year. The SEC Champ is not going to be shut out of the College Football Playoff. Period. With that in mind, UGA has no reason to shy away from big out of conference games moving forward. If Georgia lost this game, it does not affect UGA's chances of making the SEC Championship, and thus, the Playoff. - Boston College: Boston is another one of America's great cities. - Michigan: Could UGA fans take over the Big House? - Texas: Austin has great BBQ, better music, and a Four Seasons. - Virginia: Top five college town, and an easy trip from DC. - Wisconsin: Madison is supposed to be wild. - Miami: This would need to be a night game. South Beach on Friday night would be a blast. Probably should wait for CMR to retire though. - Oklahoma: Have you been to Oklahoma? I have. - Ohio State: There is nothing remotely appealing about Ohio State. - Florida State: The rich man's Georgia Southern. Give all the credit in the world to Josh Brooks at UGA for coordinating the Notre Dame home-and-home series. It was the best UGA fan experience I have had. Some other things that Brooks has brought to UGA include the Jason Aldean/Luke Bryan concert in 2013, and he has worked with Augusta National to make Sanford Concessions more efficient. Brooks has the UGA decision makers' ear and respect, and is doing a great job to make being a UGA season ticket holder more valuable. ND's graphics on the video boards were very cool. Each animation featured their campus somehow. Touchdowns were an cool animation of Touchdown Jesus. "Get Loud" messages were cartoons of students partying in the dorms. This was a great way to tie the event on the field to the larger context of the University - and thus reinforcing why a ND sporting event was special. The Cubs also did this, and this is something that could be easily replicated at UGA. "You're not going to see Kiss Cam...You're not going to see the Awkward Dad Dance Cam or the Flex Cam. You're going to see a lot of history. You're going to see a lot of replays, and you're going to see a nice blend of things that are going to get the crowd pumped up through football highlight videos and stuff like that. "It's what we've always done here -- the football and the pageantry and the students and all of that. We're just looking to visually enhance it." Also - noticeably absent was an emcee. When ND played rap music, they would put an info banner on the screen showing the name of the song as well as the player who requested the song be played. What a great way to play music to get the players psyched up AND show those in the crowd who may be against rap music what it means to the guys on the field. It also makes the players more personable. This was a killer feature. All stadium signage, from gate numbers to concession menus to bathroom signs and more, were consistently branded using a very cool art-deco theme. This reinforced the golden-age feel that comes with all things Notre Dame. It was very much anti-Nike, and reminiscent of the same elements seen at Augusta National during the Masters. If I am working at UGA, I am calling that designer and asking them to do an audit of all signage elements around Sanford Stadium to create a similar unique and nostalgic feel Between the Hedges. Walking in the stadium, you are greeted by Disney-World style music being pumped into the corridors. The music, of course, is a loop of Notre Dame fight songs. This was a very cool touch and immediately got you amped to be in the gates. Also, signage and murals depicting vintage Notre Dame game programs, logos and ticket stubs were everywhere in the stadium corridors. This reinforced the idea that the day's game was just one more chapter in a long history of Notre Dame football - and it created value in the feeling of being there. How great would it be to replicate the same thing in Athens?! Notre Dame had a killer band - and their best feature was how they paraded around their beautiful campus before the game. How cool would it be to see the Redcoats march from the Arch or from Stegeman down to Sanford before each game? 8. This is the best UGA Defense I have seen since 2005. Back to X's and O's - I don't remember being slack-jawed watching our D play since Greg Blue was in the secondary decapitating Vandy players. 9. What a great looking uni matchup. 10. I have no plans to ever return to Notre Dame. There is no way to ever top this trip to Indiana. Veni vidi vici. Onward and upward! Nothing like being a Bulldawg on a Saturday Night!